This oval-shaped dial is extensively inscribed in Latin and German with instructions for proper use and also with the motto 'the critic should despise nothing unless he can make it better'. 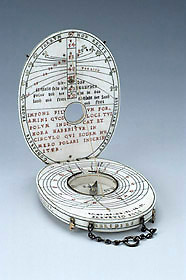 The wind rose relates weather to the directions of the winds. An unusual feature of this dial is the silver suspension chain.